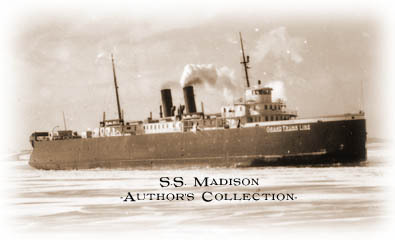 The S.S. MADISON was one of six ships built to the same design by the Manitowoc Shipbuilding Company. Built in 1927, she entered service for the Grand Trunk just before the start of the Great Depression. Her sister’s included the PERE MARQUETTE 21 and 22, built in 1924, the ANN ARBOR NO. 7, built in 1925, the GRAND RAPIDS, built in 1926, and the CITY OF MILWAUKEE, built in 1931. She was built to replace MILWAUKEE (formerly the MANISTIQUE MARQUETTE and NORTHERN 1) lost in a storm with all hands in 1929. The S.S. MADISON has the distinction of having been christened with a bottle of Wisconsin milk, instead of the traditional champaign. One of the more interesting mishaps suffered by the S.S. MADISON involved her sister-ship, GRAND RAPIDS. 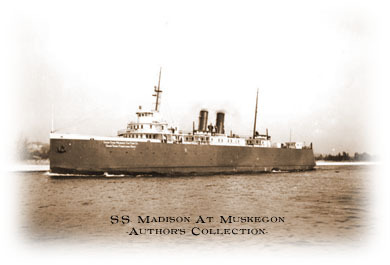 The MADISON was leading the way across Lake Michigan when she was struck from behind by the GRAND RAPIDS. One of her major modifications occured in 1961. Her spar deck was raised 3 1/2 feet to handle taller cars at a cost of $118,000. In September of 1976 she was taken out of service and eventually scrapped in 1989. January 17, 1927 -- The Grand Trunk carferry MADISON was launched and was christened with a bottle of Wisconsin milk. 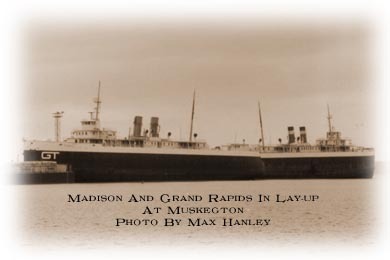 March, 1927 -- Grand Trunk carferry MADISON entered service. January 21, 1928 -- The Grand Trunk carferryMADISON approached Grand Haven in a heavy wind and drifting ice, hit a bar that had been formed by storms about 150 feet off the pierhead. She grounded and sustained $49,200 damage. March 14, 1928 -- The Grand Trunk carferry MADISON hit the Army dredge General G.G. MEADE, berthed on the south bank of the river for the winter. The outbound MADISON was proceeding downstream hugging the north shore to give the dredge a wide berth. When abreast of the MEADE, the ferry's prow went aground in the mud, causing her stern to swing around hitting the dredge hard. January 31, 1930 -- While the Grand Trunk carferry MADISON was leading the way across Lake Michigan to Grand Haven, she was struck from behind by her sister ship GRAND RAPIDS. 1961 -- The MADISON's spar deck was raised 3 1/2 feet to handle taller cars. Cost: $118,000. March 25, 1963 -- The Grand Trunk carferry MADISON ran aground in Muskegon Lake in heavy fog. On March 26th she was pulled free by CITY OF MILWAUKEE. November 17, 1925 -- The Grand Trunk carferry MADISON was sighted after causing alarm that the ship might be in trouble. She was reported overdue on a trip from Milwaukee to Muskegon, causing the Coast Guard to launch an air search for the vessel. December 1, 1971 -- The Grand Trunk carferry MADISON sustained serious damage to her cardeck while in a storm. She developed engine trouble and was adrift in Lake Michigan for several hours with a ruptured steam pipe. April 11, 1974 -- The Grand Trunk carferry MADISON became the first non-Chessie carferry to dock at the Jones Island facilities at Milwaukee. The Grand Trunk docks were closed down in a cost saving measure. September 24, 1976 -- TThe Grand Trunk carferry MADISON was taken out of service. August 17, 1988 -- Tugs moved the Grand Trunk carferry MADISON from the old Grand Trunk dock to a dock adjacent to the Mart Dock in Muskegon. September 6, 1989 -- The Grand Trunk carferry MADISON was towed from Muskegon to Port Colborne by the tug CHIPPEWA after being sold for scrap.